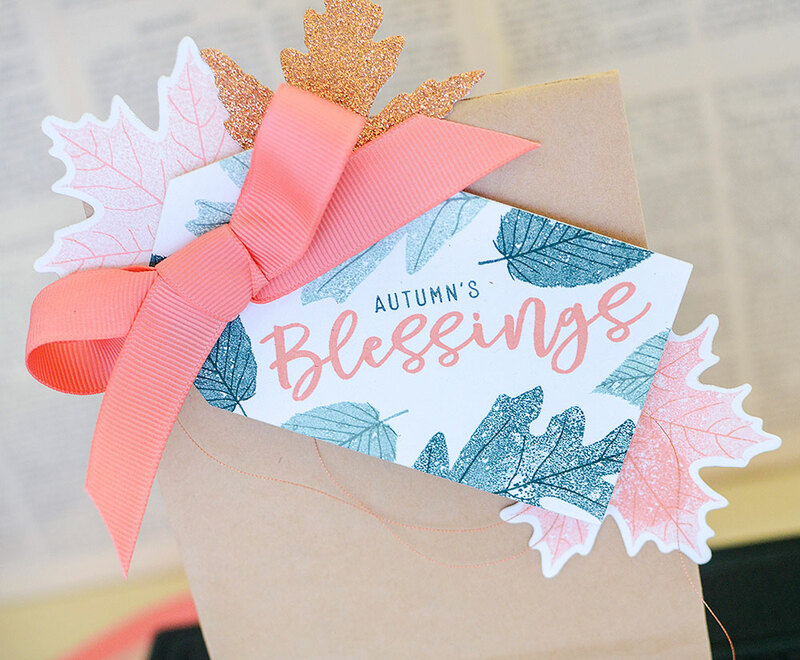 Being that it’s September and we’re moving into my favorite time of the year, I thought this month’s packaging post should reflect the transition between summer and autumn. Here in Southern California, we’ll likely not hit cooler temperatures and changing leaves until November, and I must say that I envy all of you who get to don comfy clothes and snuggle up with warm, cozy blankets. Different territories ease into fall at their own pace, with warmer climates like mine seeing only glimmers of seasonal markers while some cooler climates are hit with an onslaught of whistling winds and stormy weather all at once. With that in mind, my post packages today could be seen as metaphoric. One of my favorite monthly features at PTI this year has been Simple to Spectacular, and I know I’m not alone here. It’s always a big hit and I’m paying homage to the great ladies who work their magic on those projects. It’s customary for them to add a little flare to their second and third cards and while I’ve gone the simple-to-spectacular route today, I’m not building on one design, but rather utilizing the elements I’m using in different ways. It was definitely time to dust off Leaf Prints, as it’s one of those sets that is always in heavy rotation in the fall. They are the stars of the show today and I used both the dies and the stamp set, doing quite a bit of 2-step stamping. That’s a departure for me and not something I do often–but I’m more than pleased with the results! I’m not quite ready to dive into the Canyon Clay-Pure Poppy-Scarlett Jewel-Honey Nut shades of autumn leaves yet. Our trees are still full and green, and of course, it’s not even actually fall yet, so I took some liberties and opted for shades of pinks and corals mixed with soft, muted greens. I’m in love with this color palette, to be quite honest! 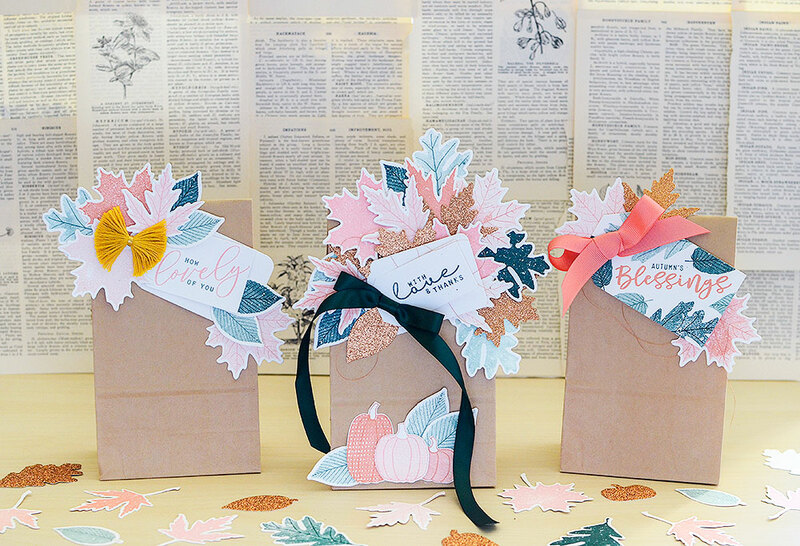 The maple leaves are inked in Melon Berry, Pale Peony, and Sweet Blush. The oak and aspen leaves are Ocean Tides and Pinefeather. 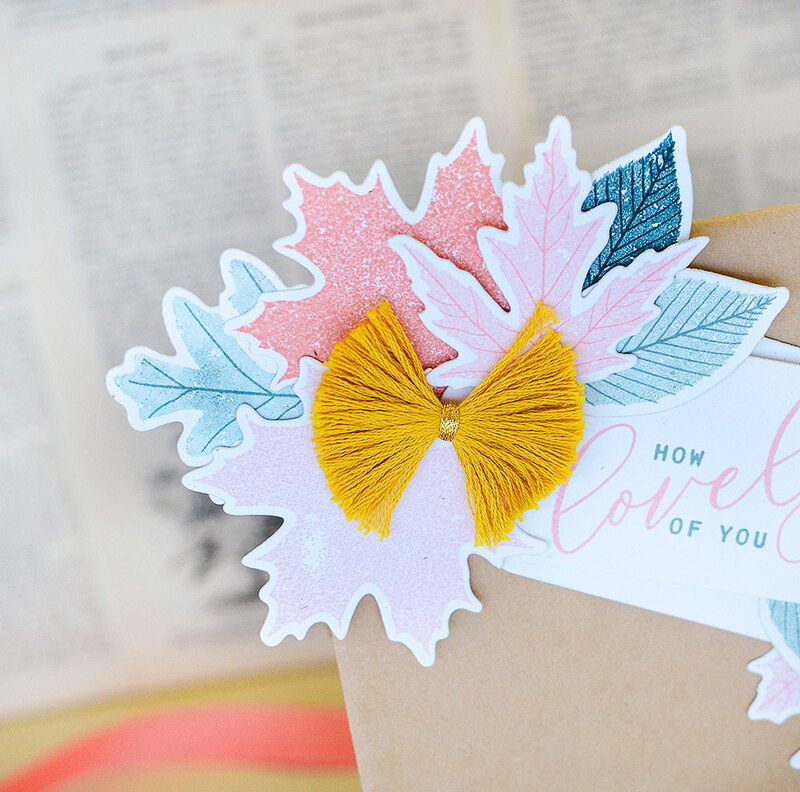 The softer shades you see of any of these colors are acquired with the effect of inking up my stamp, stamping once on copy paper, and then stamping on Rustic White cardstock. I used kraft coffee bags as my packaging material, folding each bag over backward and securing. 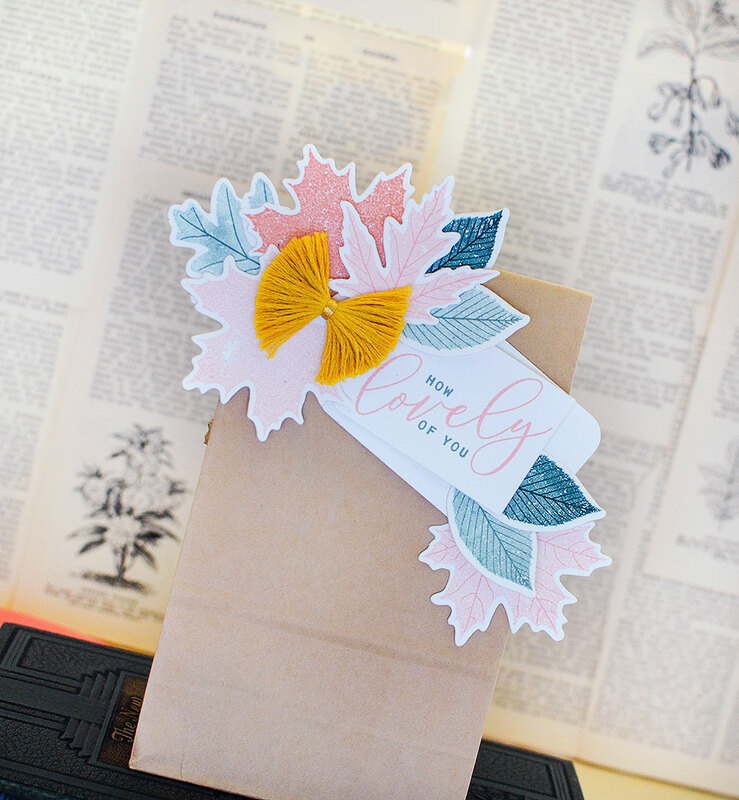 The first package is the simplest design, however, since it was the last bag I decorated, I was feeling bold and wanted to try something I wouldn’t normally do for it. 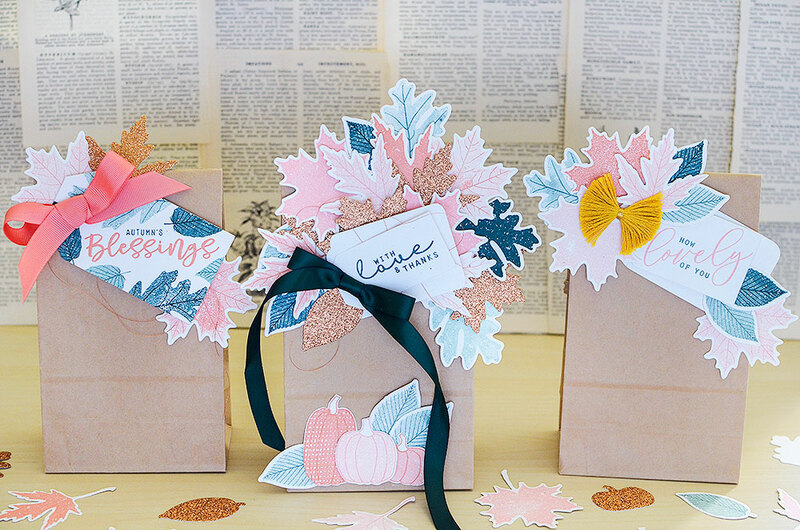 I’d used lots of leaf die cuts on the other bags and decided to keep it minimal in terms of those. Where I went big was the tag. 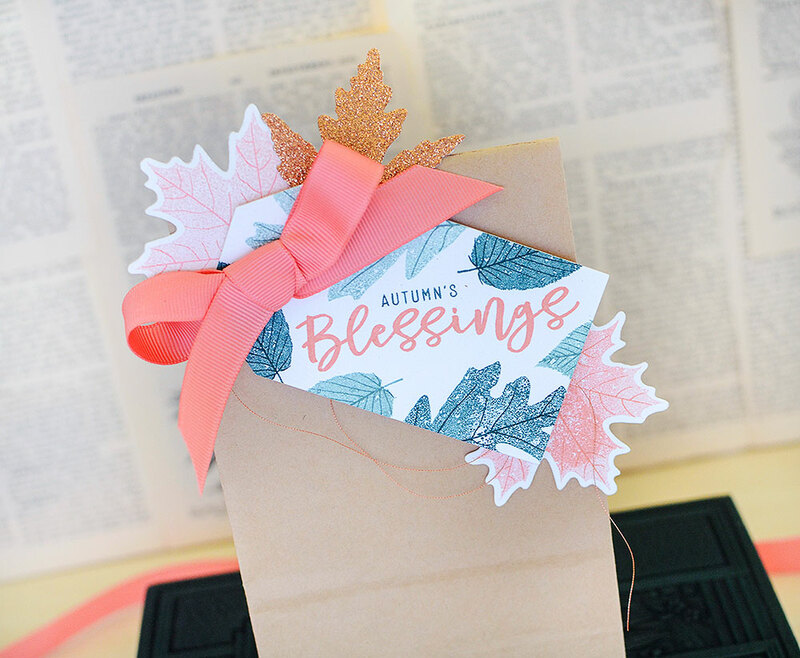 I stamped “Blessings” in Melon Berry, and stamped “autumn’s” in Pinefeather (stamped off once for a lighter version) above it. 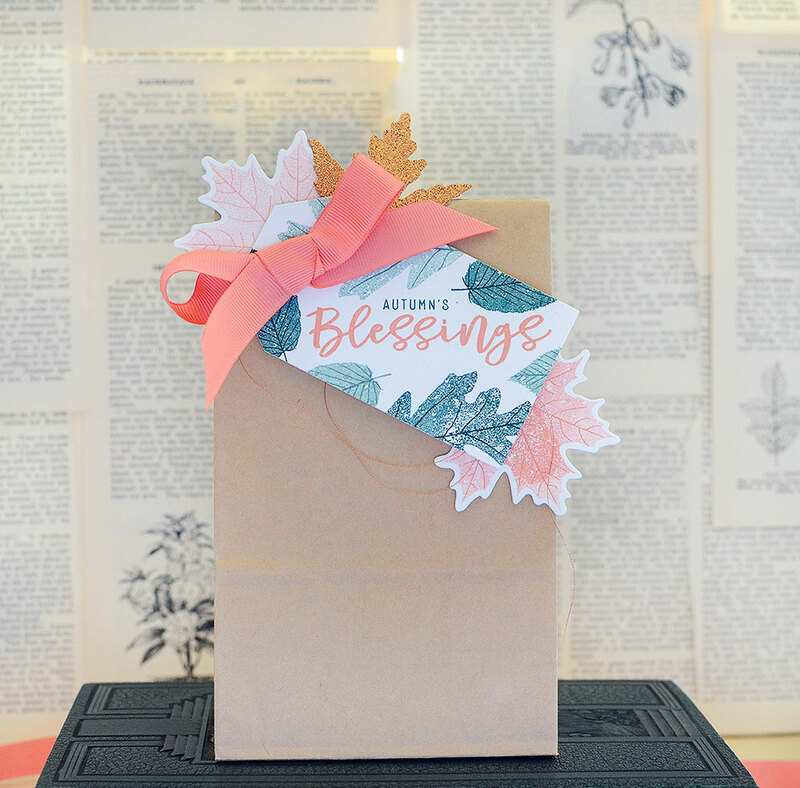 Those stamps are from my Frame It Out: Many Blessings stamp set. 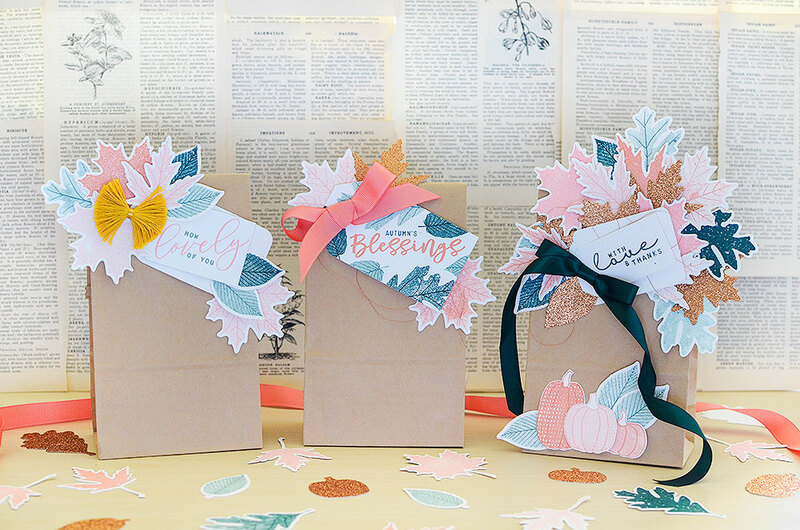 I stamped them at an angle and then stamped oak and aspen leaves all around the sentiment with the muted Ocean Tides and Pinefeather inks. To stamp the veins of the leaves, I used the same inks as they were intended. I’ve never really made a tag like this before and now I’m in love!! 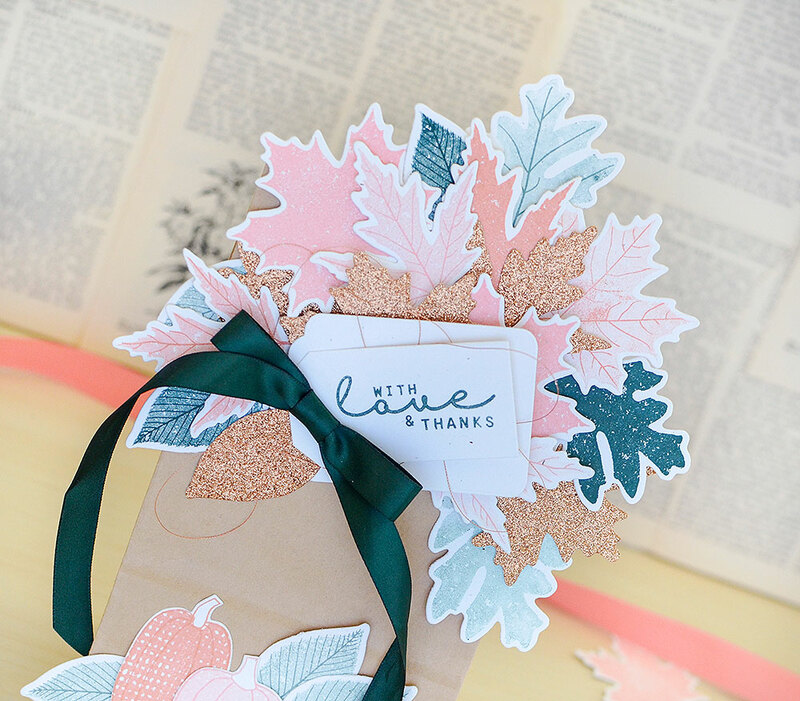 A trio of die cut maple leaves strategically placed under the tag frame it and add in the warmer colors. The smaller maple leaf is cut from copper glitter paper, which I found at the craft store. I added some metallic copper thread behind the tag, too, for another touch of texture. 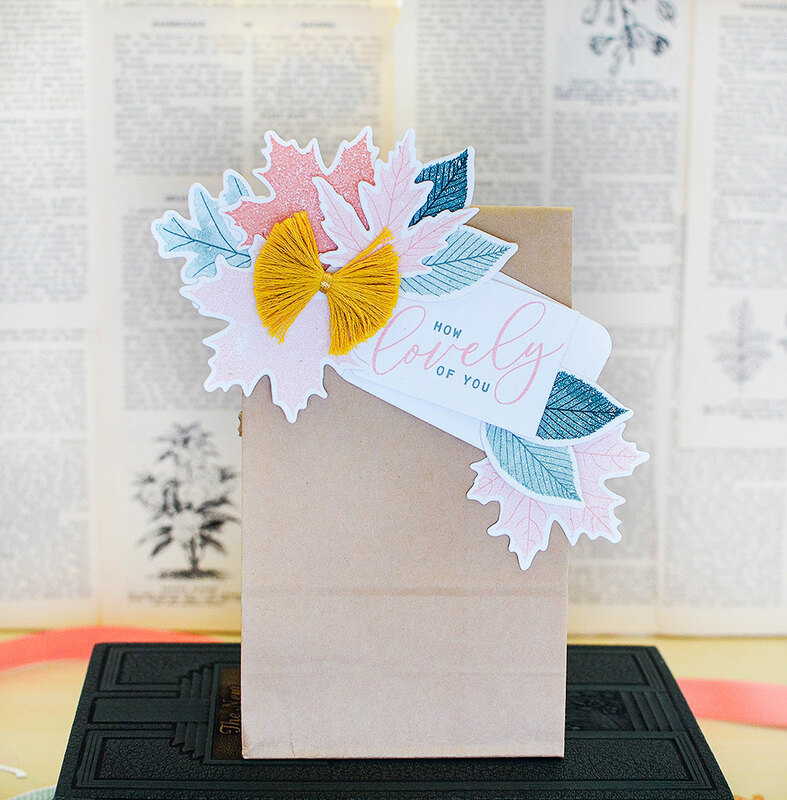 To finish, a bow from Melon Berry grosgrain ribbon gives this package a pop of saturated color. This bag carries on with the layers of leaves, but I’ve used many more of them. 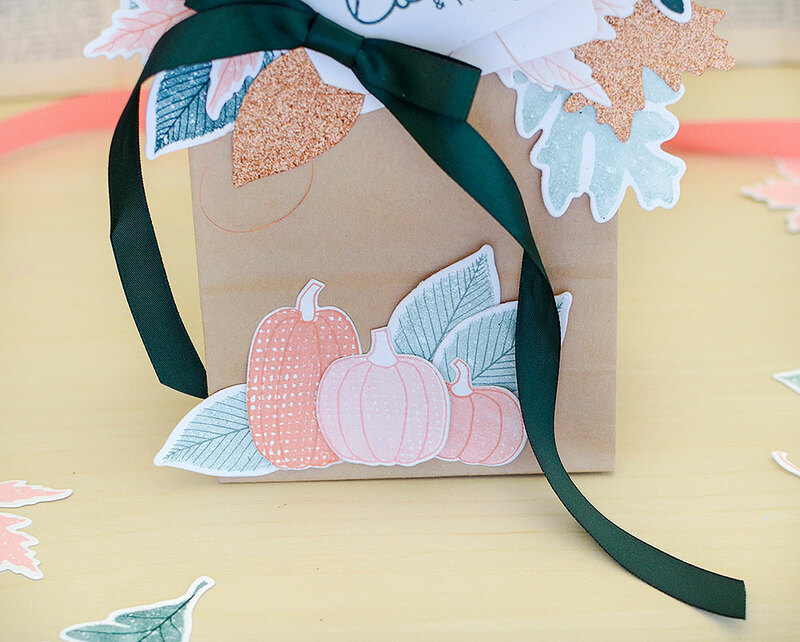 With the first bag, I really wanted to draw attention to the tag, using the die cut leaves as accents. 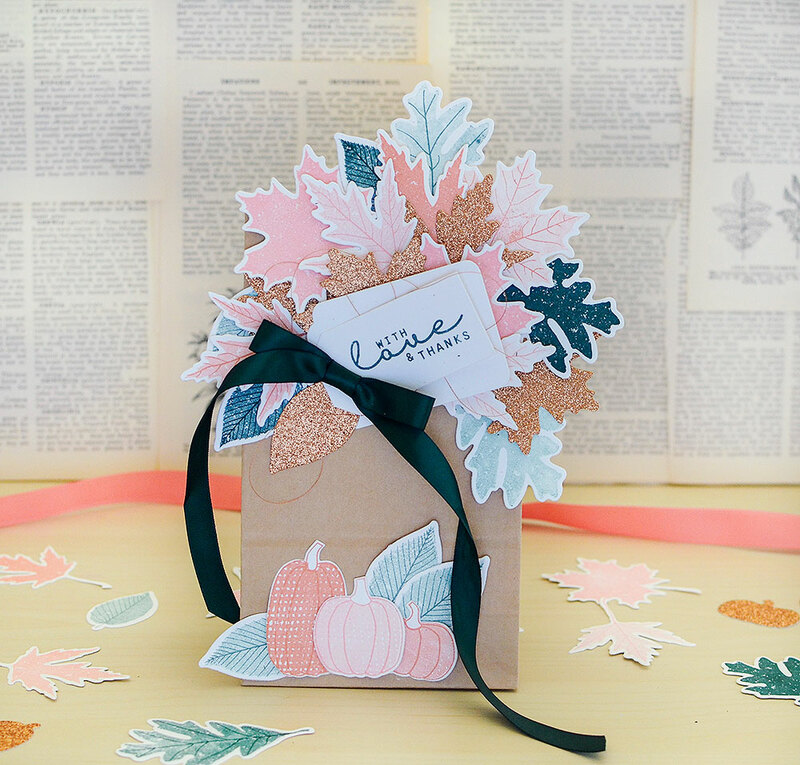 On this package, I wanted the leaves to be the focus, showing off their shape, layers, and beautiful colors. The tag here is the accent, not meant to outshine the stars of the decor, but to act in a supporting role. I used a large scalloped tag matted with a medium essential tag, both cut from Rustic White. 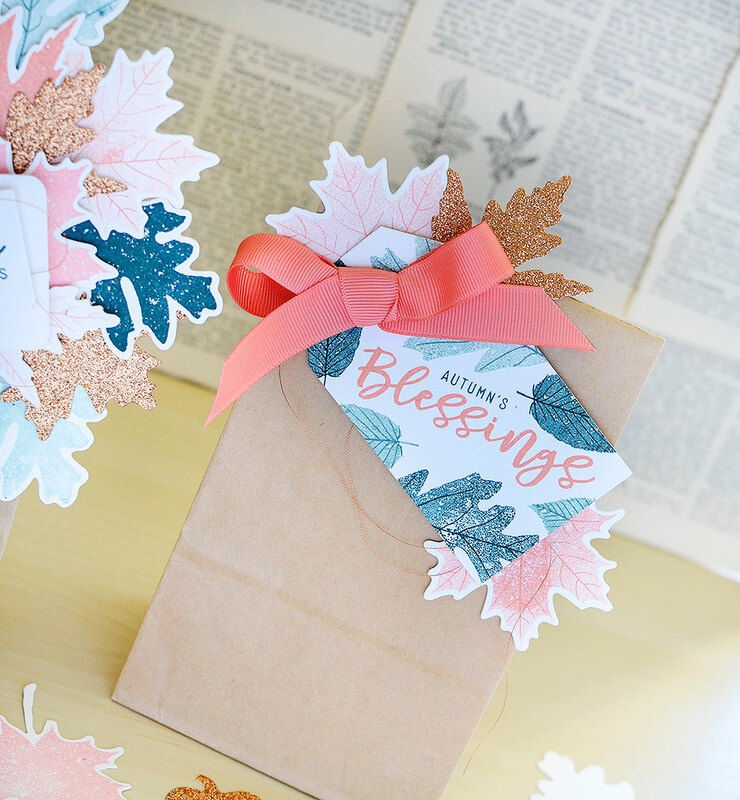 I could have stamped a pattern on the scallop tag or even cut it from a coordinating cardstock color…but I wanted it to blend in without competing for attention or creating overwhelm and chaos on this package. 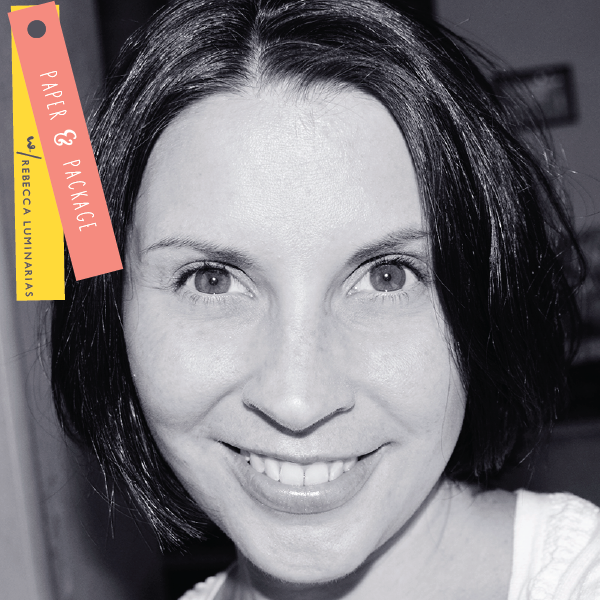 I also liked the look of the mis-matched tags–one with rounded, soft corners and the other with sharp angles. And now, it’s time to go big or go home! My “spectacular” package reminds me of an actual tree with an abundance of colorful leaves. There are 18 leaves covering the top portion of the bag. I started in the right corner and adhered each one, alternating between color, style, and texture until half the bag was covered. At that point, I wanted to add a tag, and I did the same here as on the previous package, using 2 tags–one scalloped, one basic essential. This set is smaller, however, because I didn’t want to cover up too much of the leafy decor I just spent all that time curating! Again here, though, the tag is support. The eye is drawn to it as it’s the only “plain” thing in the bunch, but it’s minimal and straight to the point without being obnoxiously loud or awkwardly overdone. 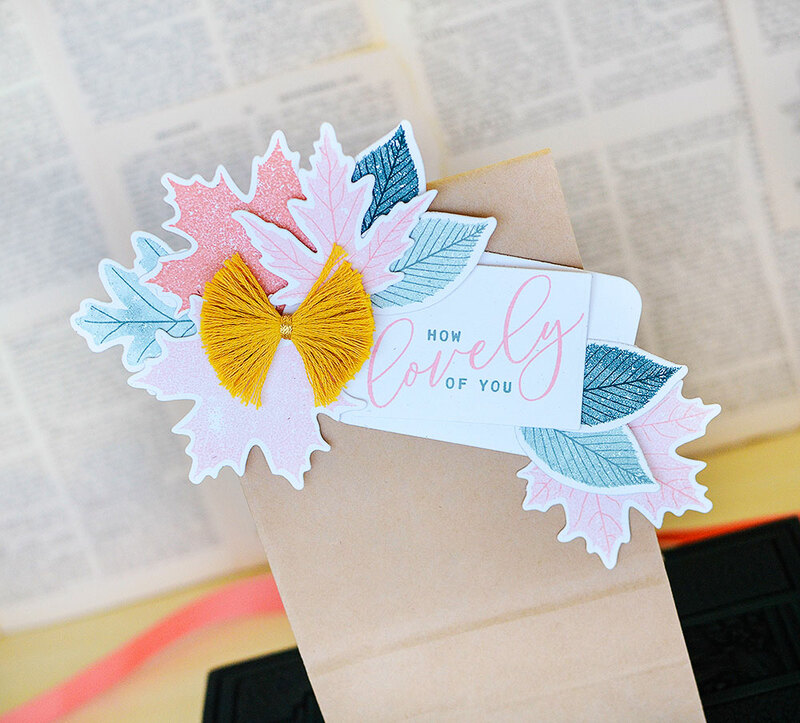 The sentiment is “stamped off” with Pinefeather ink and I added a wisp of copper thread and a satin Pinefeather bow with long, uneven tails. So, which is your preference? Mine is the second. I think the last package is a little too much for me, but I definitely know people I could give that to and they’d be over the moon to get it! 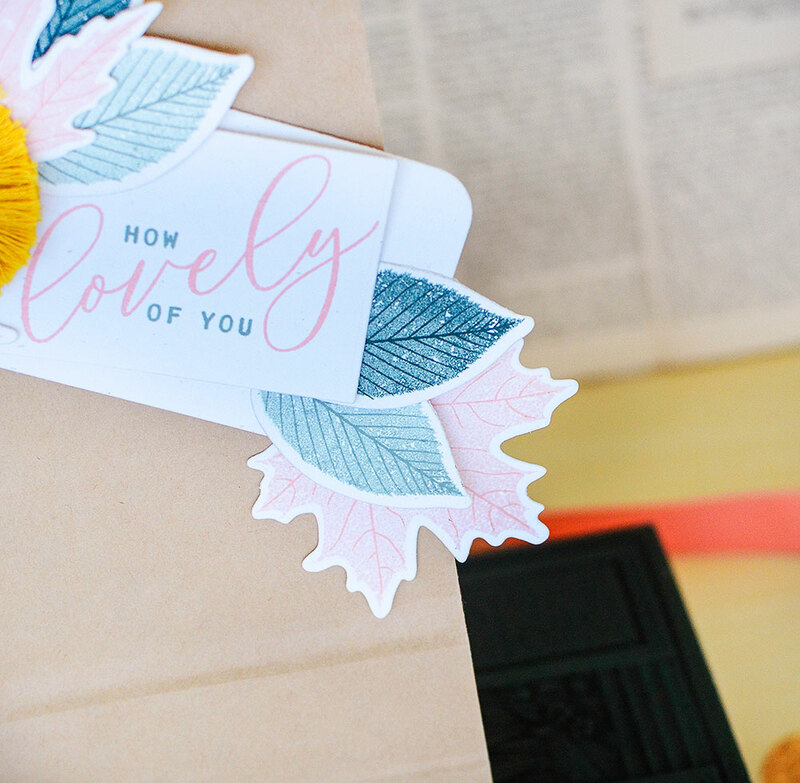 Do you ever decorate your cards and packages based on your recipient? I don’t just mean making a masculine card for a man or stamping a unicorn on a bag for a little girl; I mean, do you stray from your personal style to fit the personality of the person you’re giving it to? I absolutely do! My mother-in-law and I, for instance, have completely different taste, but I know she would be floored to receive a gift wrapped up like #3. She would appreciate the time I spent creating it and would feel nothing short of special knowing it was made just for her. So while it might not be my first choice of the three, it never hurts to try new things and stray from your personal style to make someone’s day. I’ll see you in October…Autumn’s blessing to all of you, sweet friends! This was a difficult decision, but I think I like the first one because of the copper thread addition. 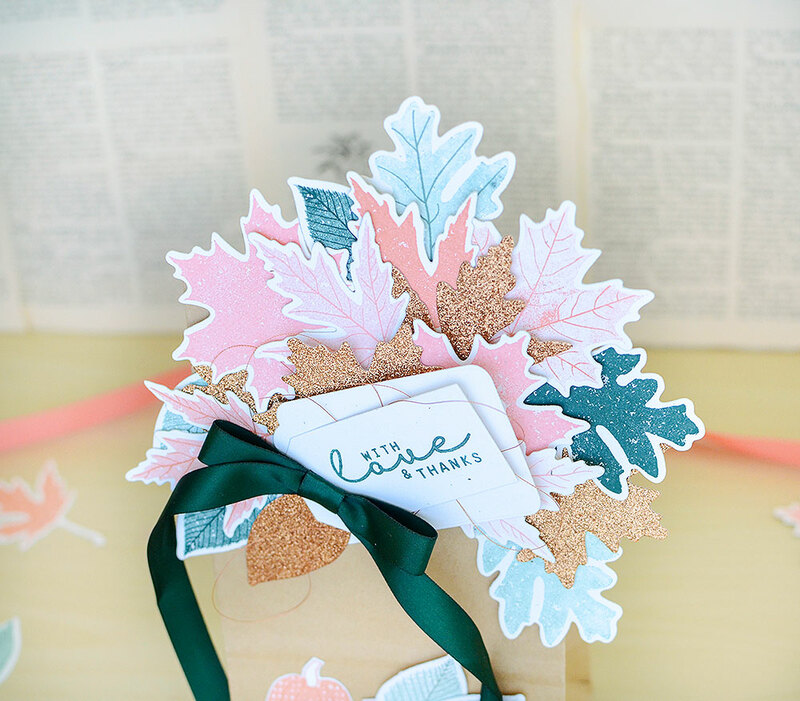 I love those copper glitter leaves. Gorgeous projects! Those colors are so lovely together! While I really like all three bags, my favorite is the one with the yellow tassel like bow. Great idea for packaging. 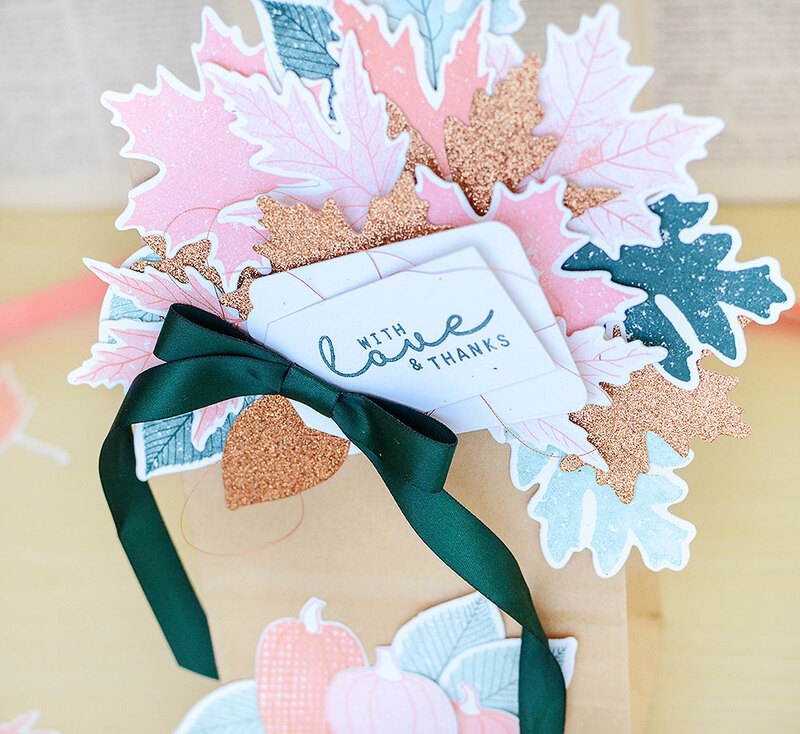 I like the mix of stamped leaves and glitter leaves. The glitter leaves add a nice bit of texture as well as some bling. I can’t decide which is my favorite! I love all three of them and in such a pretty color combo. I love everything about this packaging Rebecca. Thanks for all your hard work. I also want to say how much I like your recent stamp sets, keep them coming. I love the tree one. these are all so beautiful! I love the pink and melon berry in there — it’s perfect for early September. I think my favorite might just be the first one; it is easier to see the glittery copper leaf. You’ve given me some great ideas! I really appreciate your lighter take on fall colors. I always get slightly depressed going into clothing stores in August to be greeted by heavy, dark palettes. 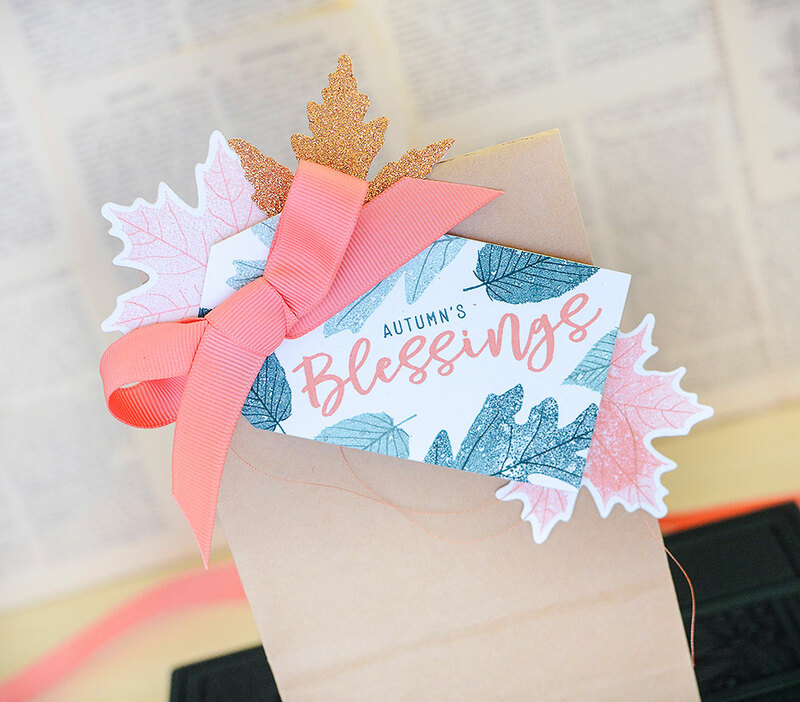 I like the Autumn’s Blessings tag the most–the way you mixed typefaces and artfully surrounded the sentiment. My favorite is the first one, who knew coral and copper would be stunning along with the greens? All are lovely in their own right, and I so understand that I would make one type for a certain person and another for someone else. Thank you for another great post! Loved your choice of colours. Who would have thought that they work so well together?